Combine sugar, corn syrup, butter, salt, evap. milk & water in heavy saucepan. Heat, stirring constantly, to boiling, then cook rapidly, stirring several times, to 238° on a candy thermometer. Soft ball when dropped in cold water. Remove from heat at once. Add vanilla, but do not stir in. Cool mixture in pan to 110°, or until lukewarm, beat 2-3 min. or until it starts to thicken & lose its gloss. Spread in a buttered pan 8x8x2. Let stand 2-3 min. or just until set; cut into squares. Let stand until firm. 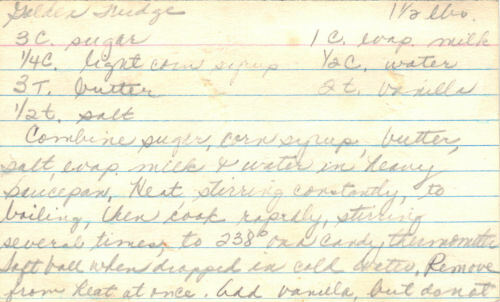 This recipe looks almost identical to my mothers handwriting. I was wondering if the person who found these recipes might let me know where she found these recipe’s?